In the short duration since Satya Nadella has taken over as the boss, Microsoft seems to be shedding the image of a laid-back software giant. With slew of decisions being taken in last month or so, it is clear that they want to aggressive and nimble to market needs. Yesterday, Microsoft released an update to their Microsoft Office mobile app for iPhone and Android, and a big surprise came as part of that update. The application has now become completely free on both the OSes for home and personal use. 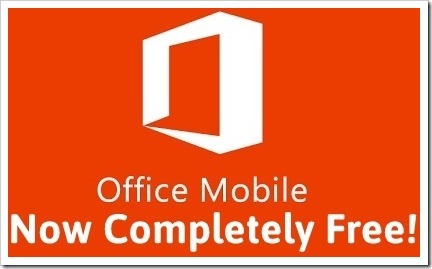 Office Mobile for Android phones is now free for home use. Prior to this update, all users needed to have a office 365 subscription to use Office mobile on their iPhones and Android. It was only available for free on Windows OS phones. So, going forward users can start to view, edit, update and share documents on Office mobile for free. Also, this facility is made available for home personal use, so businesses will still need to pay the subscription charges if they need to use Office mobile. While Office is the defacto document creation and editing suite on desktops and Notebooks, they were not able to simulate the same success in mobile world. Firstly, they came in quite late, and secondly it was available only for Office 365 subscribers. iWork on iOS and Google docs on Android/iOS have taken bulk of mobile market share. However, now with Office mobile becoming free, it would be interesting to see if mobile users shift to it. Whatever said and done, it is heartening to see Microsoft moving into “free app” territory, especially in Office space, which has been their bread and butter over last couple of decades. Apart from coming on phones, Office mobile yesterday launched on iPads and will also be soon coming to Android Tablets as well!